Somebody has gotten it into their heads there ought to be winter in the Southern Appalachians. I was not consulted. I was thinking I should have had my head examined when I showed up in autumn apparel at a deep-valley trailhead on the west side of Grandfather Mountain and stepped out of the car into a wake-you-up-like-strong-coffee chill. It couldn’t have been that cold — low-30s maybe — but all those years of perfect Bay Area climate have made me a to-the-marrow weather wimp. 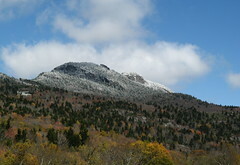 Grandfather Mountain in mid-October 2009 after a previous dusting of snow. Things had nowhere to go but up after I slipped and stepped into the creek about 20 yards from the trailhead. My left foot never dried till I got back home. Hard to believe that on Nov. 16 I hiked at Mount Mitchell — tallest peak in the East — on a mid-70s day with skies so clear you could see Africa if it weren’t for that inconvenient curvature of the Earth. In three weeks the weather went from impossibly good to simply impossible. Snowy weather all day Saturday coated Grandfather Mountain with a mere three inches of moist powder — just enough to make the challenging rocky trails at the summit break-a-leg slippery. 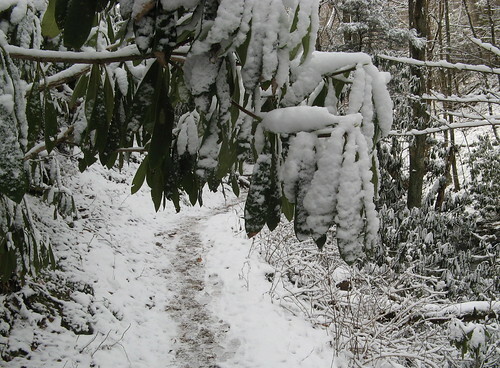 Grandfather Mountain’s famous Mile-High Hanging Bridge was coated with ice and closed to the public, and the road to the top wasn’t opened till around 1 p.m. I arrived at the main entrance to Grandfather Mountain about at 10:30, eager to pay my $15 and drive to to summit-area visitors center. A young woman in the front gate office told me the road to the top might be cleared and deiced by sometime after noon. I didn’t want to wait that long, so I asked her for a map and headed for the Profile Trail on the mountain’s west face. Some background on Grandfather Mountain before I hit the trail: The highest point is at 5,946 feet. 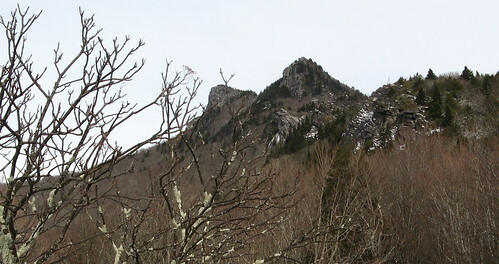 The peak is the centerpiece of a huge privately owned nature preserve; though the state of North Carolina has established Grandfather Mountain State Park, the main features of the peak (the hanging bridge, museum, animal habitats, summit-area trails) are privately managed and a $15 entrance fee pays for upkeep of the attraction. Hikers can get enter the park free from a few backcountry trailheads — but the shortest route to the top (Daniel Boone Scout Trail) is three miles one-way with 2,000 feet of elevation gain, and the only way to it is via the Blue Ridge Parkway, which is typically closed when the weather gets snowy. My hike started out on the other side of the hill, on the Profile Trail, accessible from State Highway 105 about 12 miles south of Boone, NC. This road might have a better chance of staying open during snowy weather, but be warned: the trailhead is at the bottom of a steep entrance lane that will be a bear to get out of if it’s coated in snow and/or ice. Once you’re at the trailhead, you self-register (the form must be filled out in duplicate; you keep one copy and put the other in an iron ranger) and hike on. It’s 3.5 miles to the summit with 2,000 feet of elevation gain. The first couple miles are fairly tame but the last one to the top is pretty wicked, I’m told. I didn’t see much of it because I had my heart set on checking out the summit when the road opened. I hiked a little over a mile in and turned back. Might as well start looking at some pictures. This creek is the headwaters of the Watauga River. I managed to step into it barely five minutes in to my hike. After an hour or so I had hiked my wet sock dry, then slipped and got it all soaked once more. These leaves full of snow conveniently cool your neck as you pass, whether you want the cooling or not. Snow hiking reminded me of the adage to “start cold” — and this doubly true if you start out going uphill. I lit out with three layers (windbreaker, light insulating jacket, light base layer top), plus fleece gloves and a ski cap and was overheating within a half-hour. I didn’t really need anything more than my windbreaker and baselayer as long as I was heading uphill. Speaking of wind: the Grandfather summit has recorded gusts over 100 mph; don’t forget to look for prevailing winds when you’re checking the weather forecast. Slipping and sliding for two miles should’ve clued me in that the craggy trails at the top of Grandfather would be, shall we say, interesting with a coating of snow, but this idea didn’t enter my head till I had already driven up the road to the top and started wandering around. I did see two guys coming down from the highest points, but they looked to be young, strong and bold, three characteristics that fled my corpus long before the century turned. I did take a few pictures, though. Looking out toward the mountains. The Mile-High Swinging Bridge (great fun in those hundred-mile gusts). Guess what: Even more mountains. We have excellent crags in these hills. The two highest peaks at Grandfather. I admit this is a rather scant introduction to Grandfather Mountain, one of the top hiking locales along the Blue Ridge Parkway. Hiking alone on snowy, unfamiliar terrain had my Inner Coward practically hollering “It’s too damn cold and slick to be hiking at all, moron,” so I ended up playing it safe. It’s rather embarrassing to have an Inner Coward, but listening to it has kept me alive to date. This is going to be one of my favorite places to hike someday — it’s only a two-hour drive (vs. three to four for some locales) and the views should be excellent when the peak isn’t fogged in. Grandfather.com — main web site for the attraction. 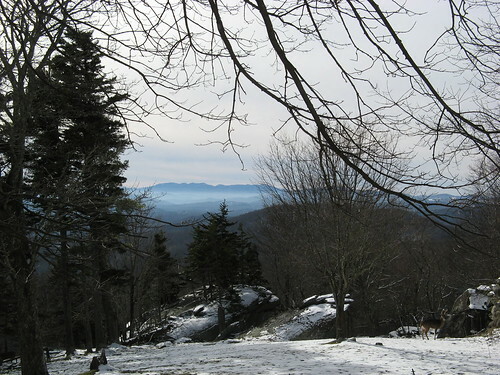 Travelbygps.com guide to Grandfather Mountain. North Carolina State Parks map (PDF download). Google map of Grandfather Mountain trailheads. Do tell about the mountain lion! The lion was in a “habitat” — fancy language for mini-zoo — the park maintains. There were two there; they seemed to get along fine. This one seemed to be looking straight at me, and sitting so still I wasn’t sure he was alive. Big cats never seem happy in these enclosures, no matter how “natural” they are. Welcome to winter on the east coast. I can remember visiting Salinas and asking if they closed one of the underpasses from rte 101 in the winter for sledding. For day hiking, one of the old tricks for sloppy weather is to put a thin plastic bag between sock layers. It keeps your feet drier and warmer, but I wouldn’t do it for more than a day hike because long term it isn’t that good for your feet (traps perspiration). Obviously you need the right equipment if you’re going to be out in this muck for longer. I like to take my rain suit in this weather because that extra layer is really helpful for avoiding hypothermia in less than optimal conditions. It is also a windproof layer for the entire body which can be rather important. Cloudland Canyon (in GA) was similarly pretty this weekend but no where near as challenging a walk. I’m definitely thinking of adding one pair of dry socks sealed in a zip-loc. The real issue with hiking on snow is preventing your feet’s warmth from melting the snow — which is why PAC boots with the thick felt liners are so nice in extreme cold. Great post, Tom! You had me goin’ on that lion shot! I’m so happy to have stumbled upon your site and this post via twitter! After I leave this comment, my next step is to subscribe to your RSS feed! Though I write about Hawaii, I’m a native North Carolinian and live in Raleigh . I grew up in the shadow of Grandfather Mountain in the little town of Newland. You’ve captured the trail so beautifully. Thank you! Looked out my Oakland, CA back door this morning, and a dusting of snow all over – not like your pictures, but quite a surprise to me at our 900 feet elevation. 41 degrees now. Snow at 900? That is low. We lived at 1400 for a couple winters and got a few nice dustings. Folks with strong legs and too much time on their hands could actually see a lot more snow than the Bay Area is known for — Ohlone Wilderness and Henry Coe backcountry get quite a bit, but only in the far nether regions. Gosh, I was in the Henry Coe Visitor Center on Saturday when a fellow came in to get his permit for a multi-day backpack deep into Henry Coe, coming out on Wednesday. He knew the cold weather and snow was coming and I am sure he must have been snowed on. Brrrrrr! He said he was prepared for it though. And I sure hope so because it is going to be cold tonight! And great pictures Tom. I’m still amazed by the parks you are finding. They look great!!!! Thanks, Tom. 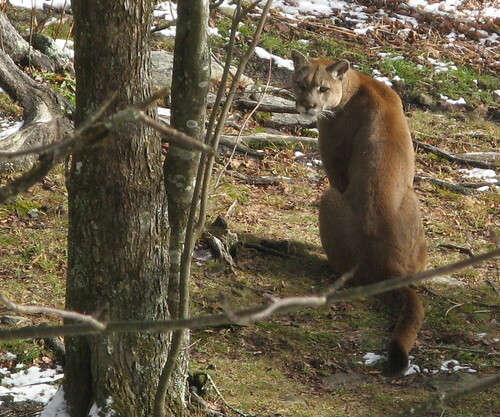 You had me with the mountain lion. I plan to appropriate “Inner Coward” and use it for years to come. Great post. Love the pics! It’s been years since I’ve been to Grandfather Mountain but I remember it fondly. Great quality pics. 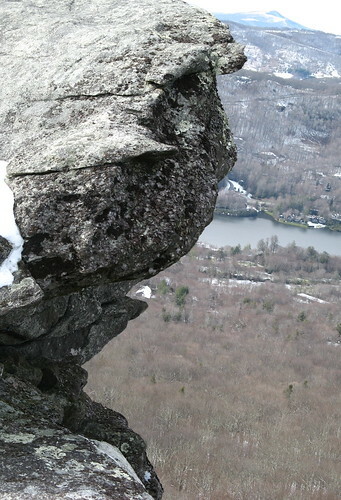 About 6 years ago I did a Grandfather hike in winter with light snow, also from the Profile side. It is really a beautiful winter wonderland under those conditions. 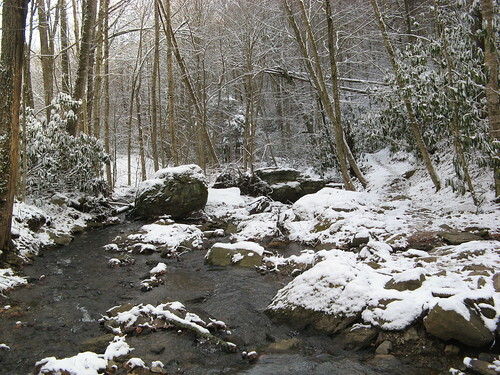 Another great high spot in the general area, which is more easily accessible in snow, is Elk Knob State Park in Ashe County. At 5,555 feet it is almost as high as Grandfather. It is not quite as spectacular, but in winter conditions would be quite a bit easier, as the trail follows an old logging road most of the way to the top. 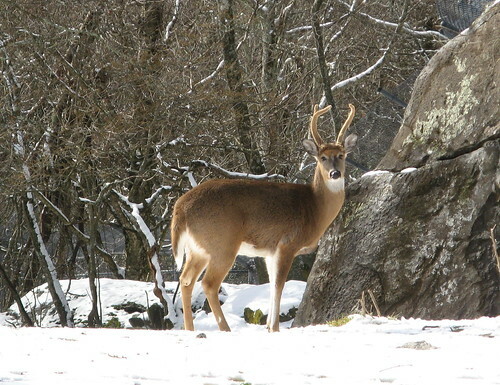 One correction to my above post … Elk Knob State Park is in Watauga County, not Ashe. Hi Tom, enjoy reading your stuff! I can’t get enough of hiking NC and Tn and am planing hiking up to the grandfather peaks and would like to stay overnite. Do you have any opinions on what campsite along The trail would be best? I use a hammock to sleep in. Haven’t decided what trail to use. Took gf trail a couple years ago to attic window and this has to b the coolest trail east of miss river. Would appreciate your feed back. Thanks, keep hiking! Brian, I did the profile trail last year and I must say, it is worth the strain to the top. It is a very tough trail but an amazing pay off once on summit. I dont know the exact name of the campsite we used, but as soon as the profile trail dead ends to the grandfather trail, I turned right and the campsite was just up a bit on the right. Great camping and a much easier walk out than in. I’ll be there this weekend to hopefully see some snow. Happy trails. Brian: I haven’t actually camped there so I would hesitate to say anything authoritative on the campsites. From what I saw (but I wasn’t looking that closely) there could be issues with hammocks. I’ve had decent luck posting questions to Grandfather Mountain’s facebook page … might be worth a try. (if you’re on facebook that is).